The unsung granddaddy of the home taping movement, R. Stevie Moore has been honing his bizarre take on pop since 1966. He didn’t get a chance to share his eccentric vision with the general public until 1976’s Phonography and many are still waiting for their first taste of this man’s awkward, but catchy musings on life. He draws on 60s and 70s rock and roll,country and the Residents/Zappa to a lesser extent, but unwittingly warps it into something entirely perverse that bears little resemblance to anything else in my collection. Ariel Pink sort of delves into this territory, but he has yet to set foot into the bizarro universe of R. Stevie Moore. 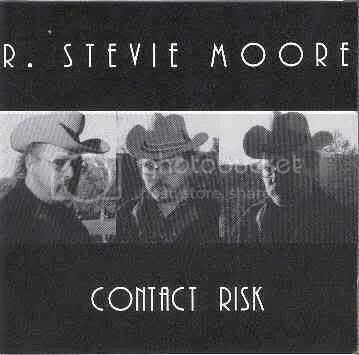 Contact Risk isn’t his best album, but it stands as one of the better ones. The opener “Your Dancing Ears” discusses high school alienation with a chorus that touches on a Visine addiction. “Can’t Afford Food” obviously touches upon his monetary woes and how he feels compelled to pursue his artistic vision despite its cost on his bank account. Many songs on Compact Risk, make that all of his albums, project an image of a very depressed gentleman who has trouble connecting with others, especially women. His song “Ill (Worst)” serves as an example of his romantic worldview and reveal his longing for a connection to others. R. Stevie Moore is criminally unheard by many who would be sympathetic to his knack for a pop tune as well as his sometimes witty, sometimes depressing lyrics. If you enjoy your pop music scattered, smothered and covered, this man is up your alley.